Home Life on the Water	Is it more fun in the boat or behind the boat? When you think about water sports — wake boarding, water skiing, tubing, etc. – do you automatically assume they are activities reserved for the young? It might be time for you to expand your horizons. Enjoying a great day on the water does not have to be limited to boat rides, tanning, or fishing. Getting the most out of a boat means using it for all it was designed. Could you imagine owning a sporty convertible and never putting down the top? Watersports have come a long way over the years and offer exciting, fun, safe options for all ages. Waterskiing has come a long way. Modern technology has made it easier to enjoy, so you don’t have to worry about re-mastering the old wooden skis that are gathering cobwebs back in the garage. Barefoot skiing is the more challenging way of skiing. You skip the skis and just use your bare feet, literally. This is the most difficult and challenging way of skiing. The boat speeds need to be faster to pull a person barefooting, so the falls — and face plants — are more severe. One option to traditional skiing is hydro foiling, also known as the air chair. It’s a chair attached to a really wide ski with two-foot bindings on it. The bottom of the ski is a long vertical strut/pole with a foil attached to the bottom. The ski brings the rider up on plane, and then the foil lifts the board and skier of the water. It’s strange to watch, because the skier is hoovering a few feet off the surface of the water. Wakeboarding is the water version of skateboarding, snowboarding, and surfing. Riding a wakeboard is a good watersport for all ages. The board itself is a small, mostly rectangular, with shoe-like bindings mounted to it. Once you “get up” all you have to do is hold on to the rope and ride. Wake surfing is just like surfing but instead of surfing a wave, you surf a wake. Of the wake trio, wake surfing is slower with less painful falls. All you have to do is grab a board and catch some wake. No rope needed. Wake skating is basically like skateboarding on the surface of the water. The board is covered in grip tape or soft, traction foam. Since there are no bindings, your feet are free to move, which helps when performing tricks. You should also wear skate shoes while wake skating. Not wearing shoes can be dangerous and can put you at risk of cutting yourself on your fins or breaking a toe if the board hits you. Unlike wake surfing, you must also hold on to the rope while the boat pulls you. 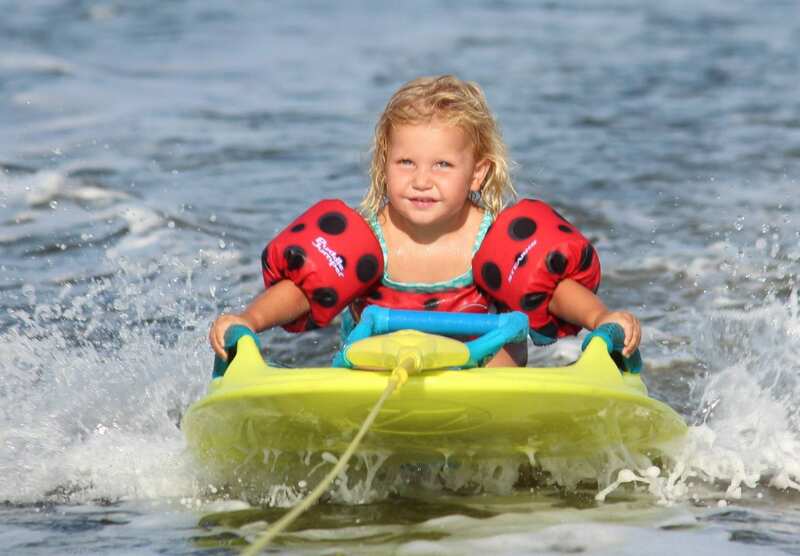 Knee boarding is one of the simplest watersports for anyone to master. When knee boarding, a rider is towed at planing speed behind a motorboat on a hydrodynamically-shaped board. Since you sit on your knees, there is a strap that goes over the knees to keep you secure. There are many new boards out there to choose from. One of my favorite boards is the new ZUP board. You can ride this board standing, kneeling, lying down, surfing, resting, or even backward. Tubing, tubing, and more tubing! Tubing is the best sport for all ages considering it requires no coordination or skill, it’s a great time and there is an array of options to choose from. Tubing today is nothing like it was back in the day when you rode on a black inner tube from a tire. Now-a-days, you can ride on a hot dogs, decks, cockpits and wings. There are so many different tubes to choose from. They have tubes to lay on, sit on, steer or even fly on. Unlike the black inner tube, all of these tubes are equipped with handles. Just be sure to hold on tight for the ride because it’s going to be a wild one!